About fifteen years ago, a group of paleontologists made a discovery (just one of many that often take place in Argentine territory) that caught my attention. It was the fossil of a mosasaur, a marine animal that lived on this planet seventy million years ago. The name that the Argentine paleontologists gave to that fossil and the place where they’d found it really impressed me. It is common that the denomination of a dinosaur or other prehistoric animal is based on the name of the region where it was discovered or after its discoverer. However, this mosasaur, this particular species, received a different name: Lakumasaurus antarcticus. Yes, the specimen had been discovered in the southernmost place on Earth and bore the name of a mythological animal. I loved the idea of a dinosaur with the name of a mythical spirit belonging to the Yámana culture, the original inhabitants of Tierra del Fuego and a large number of islands that mark the end of the American continent. “The end of the world”, as Jules Verne called that region … except for Antarctica. That animal had lived on a very different Earth. What today is composed entirely of perennial ice at that time was a tropical, fertile and warm land. A landscape gone millions of years ago that could well have been another world. When I was still studying astrophysics (later I decided to change my career and got my PhD in philosophy), I used to spend many hours at the Museum of Natural Sciences of La Plata (which is inside the campus). And every day I used to admire the replicas of the prehistoric animals that had lived on a planet very different from mine and, even so, the same one. When I heard the news of the discovery of Lakumasaurus antarcticus I was already studying philosophy, in Buenos Aires. I could not help but to join the memories of my hours with those ancestral and gigantic bones with the myths that I was investigating at the time for my thesis. Yámana myths among many others. And the myth of Lakuma, the Spirit of the Waters, especially. I felt that many things in my life were being reconnected by de magic of a very distant creature and place. 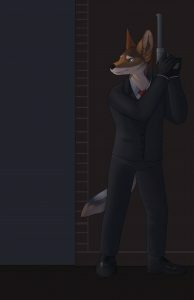 When, a few months ago, I was asked to write a story about a South American monster, I had no doubt about what it would be. 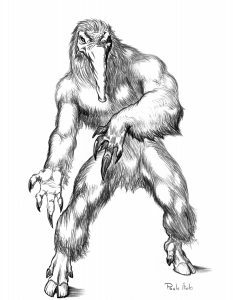 It would have been impossible to speak of another monster that was not Lakuma: a “monster” that, at the same time, is mythical and scientific (indirectly, of course). And a monster that, far from being “terrible” to me, is deeply evocative. After years of studying astrophysics and visiting the dinosaur room of the museum, after a PhD in philosophy and research, one day I decided to dedicate myself completely to my passion: writing. It seemed that I had always been jumping from one island of reality to another, just as the Yámanas had lived moving from one south island to another in search of food and dreams. As a writer, Lakuma became a symbol of my life, of what it was and what it is, of worlds as different as the Cretaceous Earth and the Earth of the present … or as Mars, Jupiter or the space between asteroids. A symbol of the possibility of living completely different experiences and, from a certain point of view, all of them “in solidarity” with each other. Thus my story was born, one that unites very different times, that interweaves mythical and factual realities, and that ultimately seeks to portray the importance of dreaming and creating “better worlds” (as the writer or the artist does) in the midst of a society that constantly attacks human dignity (a society that often considers its members an statistic). There was a time when there were not in the South Pole, as there are today, miles and miles of ice as vast and deep as the geological abysses. A time where those lands exuded a green and exuberant vegetation. Days in which immense fusiform reptiles dominated the life and death of its warm seas, as if they were the spirit of its waters. For millions of years, day after day, this was so. And if there had been humans at that time, they would never have hesitated to consider those landscapes and that life as “inevitable” or “eternal”. But now we know that was not the case. Probably (hopefully) there will be a future in which humans will populate the Solar System and beyond as if we had always belonged to space. And surely there will also be those who will think of that reality as something “eternal” and “immutable”. If science fiction is the literary form that announces change (all change), it is also the literary form par excellence that announces the possibility of the different, of the other. The non-immutability. In our human history, monsters have always been “the Others”, the different ones, those who do not conform, those who demand to be respected for who they are. Science fiction talks about monsters to be able to talk about the different in a symbolic way and show the need for that difference. The beauty of the monster. Society loves the status quo, of course, but life shouts with all its strength that change is not only necessary but inevitable. The “monsters” exist, but they are not what people should fear. We are all monsters as we seek our originality and we separate ourselves from “the establishment”. Lakuma is my monster, the symbol of what adapts to the sway of the times (just like its body adapts to the waves of the sea), but also of what is capable of anchoring itself to the ideals of a better world (ideals dreamed and put into practice, like those of the Yámana shamans). And what are those dreams that give me roots but also wings? Those that imply that everything can and should change, but that it is necessary to work so that this change is for the better. Those of a world in which we see the end of inequality between genders, the freedom to be what we are and want to be (and yes, I speak of the right to be LGBTIQ +), and where there is a true human brotherhood (beyond of cultures, socioeconomical differences, skin colors, countries of origin, capacities, etc.). The Lakumasaurus antarcticus teaches us that nothing is permanent. That the kings of the sea, like the retrograde and inhuman ideas that are dominant in an era, must evolve or perish within the framework of the long marathon of time. Lakuma, the mythological being of a vanished people, teaches us that the best of a human group, the noblest of what the human being can be, remains beyond themselves in those ideas that prove to be “monsters” before the dead and cold eyes of ossified prejudices. In my case, these monsters allowed me to see myself (accepting myself as the “good monster” I want to be, without the fear of being different), and to think, to dream and to create worlds where the landscape is wide enough to shelter each and every one of the people (wonderfully different from each other, as we are all) who want to read my stories. 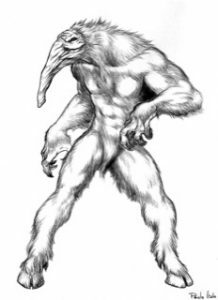 A quick google search will inform anyone interested that a Gualicho (or Gualichu) is a spirit from the mythology of the original people of Patagonia. It’s the kind of evil spirit that every mythology has, and was often used to explain away every misfortune that befell the tribe. Now, I’ll be honest: I knew very little about the Mapuche people—the native population of parts of Patagonia—until very recently. Argentina is a mainly European country and native populations represent a tiny percentage of the overall population. The history and traditions of the original inhabitants of the country are only superficially studied in school. When one encounters a person of evident native ethnicity, most assume that they are more recent immigrants from Bolivia or Paraguay. These attitudes are the result of initial wars of conquest followed by a few centuries of assimilation—unlike in other areas, the original sparse native populations succumbed mainly to intermarriage with the much more numerous Europeans. Nevertheless, I’ve heard the word “gualicho” countless times in everyday conversation. It has lost its original meaning to become synonymous of any kind of magic spell cast by a witch or shaman. Somewhere in the wars of subjugation of a people who were far from most centers of commerce and population, one concept burned so strongly that not only was it understood by the conquerors, but it survived and entered the dominant Spanish language to live on in the vernacular. Two hundred years later, an Argentine writer of mainly Italian ancestry (only a quarter of my forebears were from Spain) sat down to choose a traditional monster from South America. 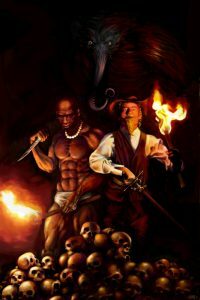 My research identified dozens of candidates, from legendary monsters to native gods and from spirits only a handful of indigenous people ever believed in to entities that frightened the superstitious colonists hundreds of years later. The process ended as soon as I found the Gualicho. I became fascinated with the fact that a word could morph and survive one of history’s truly definitive wars of annihilation. It must have had some powerful mojo. As a term that reaches us through an essentially oral evolution, the etymology is pretty confused, but in my imagination, I can see the Mapuches repeating it again and again every time they came into contact with those Europeans who, through firearms or disease, had become so intimately connected to the unimaginable evil befalling their people. There was nothing else you could call them, was there? Those pale-faced interlopers must have seemed to be perfect stand-ins for the evil spirit that haunted their people. But who would it fight? Would it attempt to ally itself with the Mapuche against the new enemy? Would it continue to torment the Mapuche’s descendants? The answer, once I understood the spirit, was obvious. This thing would fight agains everyone. Well, to get that answer, you’ll have to read the story. Hello all! I’m Christopher Kastensmidt, author of The Elephant and Macaw Banner series and “A Parlous Battle”, a story in that series published in American Monsters. The Kalobo (or “Capelobo”, as it’s known in Brazil) is a relatively unknown legend in Brazil. Dozens of people have told me over the years that they’d never heard of it before the Brazilian publication of “A Parlous Battle” way back in 2011. 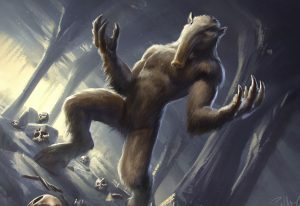 In fact, if you Google images with “Capelobo”, the most popular images of the creature are those related to my series. I’d like to share a few of those here. 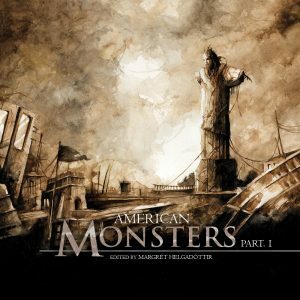 Many thanks to Margrét Helgadóttir for the chance to introduce this creature to readers around the world in the American Monsters anthology. For those looking for more stories from The Elephant and Macaw Banner, the complete series is now available in one volume from Guardbridge Books. 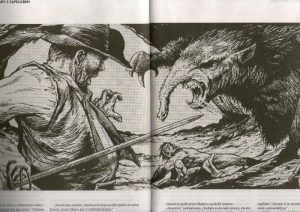 The duality of human nature is one of my favourite topics to write about, that’s why when I was invited to be a part of American Monsters, I immediately though about the lobisón; the Guaraní myth of the seventh male son becoming a wolf when the moon is full. The word werewolf is often associated with fur, claws and fangs. Monsters howling at the moon. But besides all the horror movies clichés, the myth itself speaks about something else; the horrifying idea that someone you’ve met could turn into someone (or something!) completely different in just a split second. The fear that rationality can evaporate and unleash that inner, wild part of ourselves that we try so hard to control. No matter how civilised, rational and well-adjusted a modern man can be, he is still at the mercy of the moon phases. At the mercy of his own hidden nature. But who benefits with supressing that wild part of the human soul? Despite some concessions must be made in order to coexist with others in a healthy society, institutions like the Catholic Church have gone too far in what repression concerns. In my short story The Eyes of a Wolf, an orphan named Estanislao is forcefully adopted by a priest in a middle-of-nowhere town in Entre Rios, Argentina. Even though the boy is doomed to become a werewolf, the priest tries to raise him a good catholic. Just like the Church tries to bury that dark part of ourselves where there is lust and desire. But at the same time, the priest fails to bury his own shameful desires for the boy. And when another young man named Tobias arrives town and Estanislao falls in love with him, there is simply no way to keep that wild, shadow side of him restrained. Tobias, like the full moon in the werewolf myth, is the trigger for Estanislao to reveal his true nature. Just like in the cheap horror movies I love so much the wolf transformation scene carries broken bones, growing fur and painful changes, confronting your own true self involves pain. And exposing that true self can be even more painful, even dangerous in a society that is becoming more and more conservative and fearful of everything that exceeds the norm. In Estanislao’s case, he has love waiting for him on the other side. 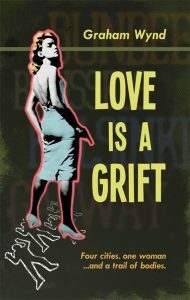 The love that accepts us for who we truly are, and knows nothing about race, class or gender. In times like these, when the Church aligns with the right-wing governments in an alarming manner (especially in Latin America) and true horrors like racism, misogyny and hate crimes against LGBT people flood the news, maybe we should look deeper into our inner wolf. Love and nurture ourselves during our painful transformations, and break free from what is keeping us bound, tamed, afraid. Find in the strength and the passion of our beasts, the freedom to be ourselves. And the courage to fight for that freedom before is taken away from us. Five years ago, we demanded that something had to be done. We strongly felt that the monsters of this world are watered down and overused in the popular media and that only a few of them dominate the scene—vampires, werewolves, ghouls, demons, zombies—all from Western popular culture. We wanted to give the monsters a renaissance as real and scary monsters, a comeback so to speak, and we wanted to bring all of the world’s glorious and terrifying creatures out in the open. 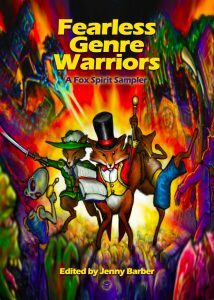 On December 24th, Fox Spirit Books released the fifth volume of Fox Spirit Books of Monsters, a seven-volume series with titles published annually from 2014 to 2020. The series is like a grand world tour exploring old myths, folklore and monster tales continent by continent. The genres used span from horror, fantasy, science fiction, post-apocalyptic, YA, crime, and the more literary. The journey started in Europe in 2014 before it continued to Africa, Asia and the Pacific region. This year we stop in Central and South America. In the latest book we present you tales of beasties and monstrous terror from Brazil, Argentina, Bolivia, Peru, Equador, Uruguay and Guatamala, told by fourteen authors who are either from, have lived in, or have another strong connection to this wide stretching region. This book is the first of two volumes covering the American continent. In American Monsters part two— out in November 2019—we will visit North America including Mexico and the Caribbean. As editor for these books, it is always very exciting to start researching for a new volume and the most nerve-racking part is when I try to find contributors. I wish to give my thanks to the editors and authors who helped me out with the research and pointed me in direction of other talented authors. I regret to tell you that one challenge turned out to be too difficult to overcome; the search for authors able and willing to contribute from Central America has been extremely difficult. It is thus with sorrow that we can’t give you more stories from authors in Central America. 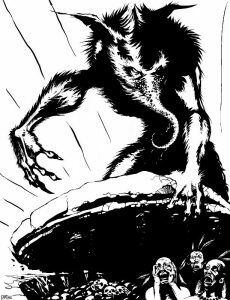 I feel however that we are still bringing you enough stories to give you a small hint about the immense folklore and diversity of monster tales in the southern parts of America. Language has been a barrier. Some of the authors in Central and South America don’t write fiction or even communicate in English, and I quickly realised that we needed to have several stories translated if I should be able to present this part of the American continent seriously. I am thus very pleased to tell you that we have five translated stories in this volume, four of these are translated (from Spanish) exclusively for this book. Thanks so much for the excellent translations from Fabio Fernandes and Mercedes Guilloux. It’s been a steep learning curve. This is the first time I have been editing translated stories but even if the process on the translated stories stretched over more time than the other stories, we managed somehow—even though not all the authors communicate in English—to edit and polish these stories too. I have learned very much from this process, something I will use the next time I need translations. So, language has been a demanding but a fun challenge. In general, I am struck by how language itself reveals an identity in storytelling. There is a certain poetic undercurrent in the voice in many of the stories, both translated and not. The stories feel dark yet oddly personal and honest. Also, I believe that the choice of words and sentence structuring give the tales a peculiar but mesmerising flow—you have no choice but to read them to the end without pause. I have been reflecting on this while editing: maybe it is the identity, the cultural identity of this geographical region that shines through? I don’t know but I hope you will like it as much as I have. And then it’s the monsters. Humans of all times, regardless of geography, culture or demography, have created stories and myths about beasts and monsters. You can find traces of them in old texts and even in old sea maps. Monster folklore is passed down from generation to generation, and these stories are important in traditions and customs. The tales serve not only as entertainment, but often teach a lesson as well. Some monsters are universal. You will always find the shape-shifters, the flesh-eating walking dead and the great monsters of the lakes and sea. But what is important to one culture might not be so vital to another. 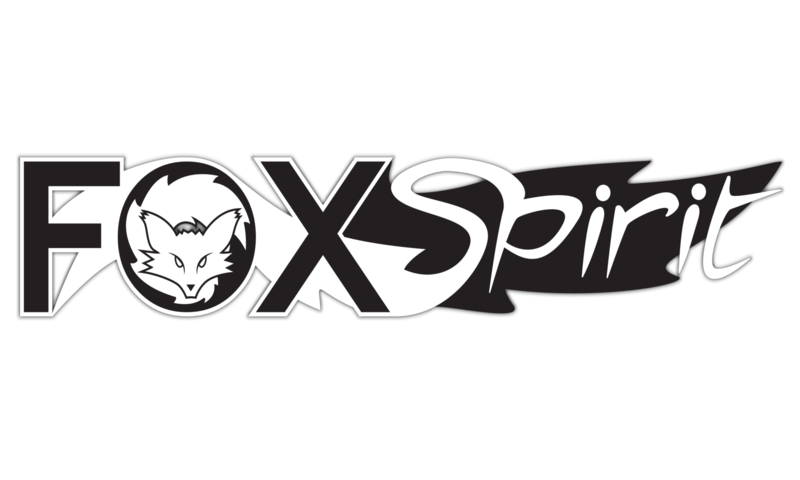 In the Fox Spirit Books of Monsters I don’t just wish to scare people with monsters they have probably never heard of, but I also want the books to give their readers an insight into the continents we cover. The stories in American Monsters part one are dark and complex, several are a mixture of magic, realism and science. Most of the stories are tales about contemporary life set against a historical blend of the Catholic Church’s influence, indigenous questions, invasion and colonialism, dictatorships, and political struggles. Quite many of the stories tell tales about forbidden taboos or the struggle of minorities, be it indigenous, gender or sexuality. The monsters portraited is also a complex mix. We have many shapeshifters, more than in previous volumes. There are beasts and spirits too. Then there are the weirder and mysterious creatures and creations, such as light, waves, mountains or even islands—all dark stories that will leave you in utter terror. 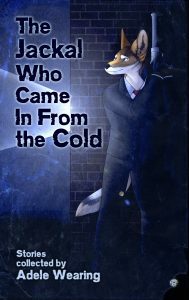 I wish to give my thanks to Adele Wearing at Fox Spirit Books and her wonderful crew, and all the artists and authors for making such a lovely book. I hope you will like this volume as much as I have while working on it. There are some monsters here I have truly fallen in love with, they are so hideous and horrible, they don’t sparkle or want to be our friend. They are the truest monsters. Enjoy!